Looking at progress day by day doesn't mean a darn thing. I am quite hard on myself, i do know this. I just feel like i have so much potential, and i don't feel like I'm growing enough, fast enough. I feel like i should be so much further in my jewelry business, that i should have learned how to be organized and efficient by now. One thing is for sure though, my photography, ROCKS. I might not by the most artistic, the best at lighting, and i surely am not the best with Photoshop, but look how much i have improved since last year!! 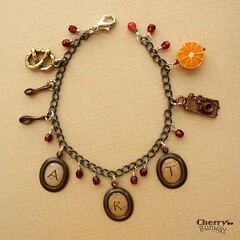 In "Art", "Bracelets", "Photography", "charms", "progess"